As part of the Wilfred Owen Festival being held in Oswestry to remember and commemorate the centenary of Wilfred Owen’s death and Armistice Day, Booka Bookshop are delighted to welcome Allan Mallinson to talk about his new book Fight to the Finish: The First Word War Month by Month. From the opening shots to the signing of the armistice, the First World War lasted almost 52 months. It was fought on, or in the waters of, six of the seven continents, and in all of the Seven Seas. For the first time, the fighting was on land, sea and in the air. It became industrial, and unrestricted: poison gas, aerial bombing of cities, and the sinking without warning of merchantmen and passenger ships by submarines. Military and civilian casualties probably exceeded 40 million. Four empires collapsed during the course of the war – the German, Austro-Hungarian, Russian and Ottoman. In all its military, political, geographical, economic, scientific, technological and above all human complexity, the First World War is almost impossible to comprehend. 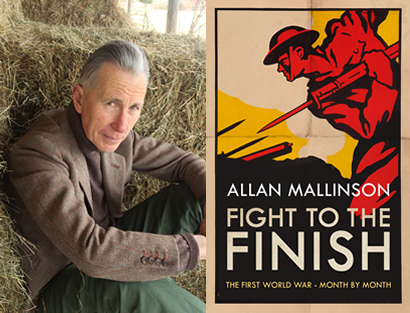 Few historians are as well placed as Allan Mallinson is to write a comprehensive account of the First World War. A soldier for thirty-five years, serving first with the infantry and then the cavalry, he began writing while still serving. His first book was a history of four regiments of British light dragoons, one of whose descendant regiments he commanded. The Making of the British Army was shortlisted for several prizes, while Mallinson’s centenary history, 1914: Fight the Good Fight – Britain, the Army and the Coming of the First World War won the British Army’s Book of the Year Award. With Fight to the Finish, Allan Mallinson offers a new and original portrait month by month on “The War to End War,” in which complexities are never lost or sacrificed for the sake of simplicity and the sense of time is preserved in a single volume history.